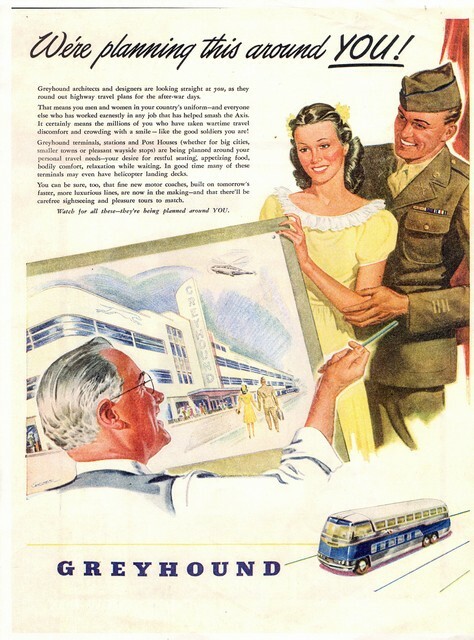 During the 1930s and 1940s Greyhound Bus Lines commisioned W.S. Arrrasmith of the Louisville, Kentucky architectural firm Wischmeyer & Arrasmith to design bus terminals all across the United States. Some of these Streamline-Moderne style buildings still exist, and are beautifully restored. Frank E. Wrenick has written a book on Arrasmith, his life, his bus terminal designs and Greyhound's roll-out of these unique buildings . Here is an exclusive interview with Mr. Wrenick! His book is expected to be published in October 2006. The cover of Frank Wrenick's upcoming book! All images copyright - the collection of Frank Wrenick. Q: What is the current expected date of publication and availability of your book? A: At this moment I don't have a specific release date. It has been scheduled for McFarland & Co.'s fall/winter release schedule and is currently in the hands of the Production Department. Once they are finished it will come to me for final review and compilation of an index. I asked them for a best guess date and they said October would be a good guess. Q: Do you have a Table of Contents to share with our readers? The biographical part of the book will touch on Arrasmith's early life, the beginning of his career and his Louisville years, the formation of the firm of Wischmeyer & Arrasmith and its work before and during the depression years, what brought Fred Elswick to the firm in the mid-1930s, how Greyhound became a client and his pre-WWII work for them. Following this is an overview of Arra's WWII years, his post-war Cleveland based work, a comparison of the Cleveland and Akron terminals - his other post-war jobs for Greyhounds, and concludes with his return to Louisville where he continued to work for Greyhound and new clients. A discussion of Arra's relationships with his various partners and diagrams of his office layouts are sprinkled throughout the biographical section. 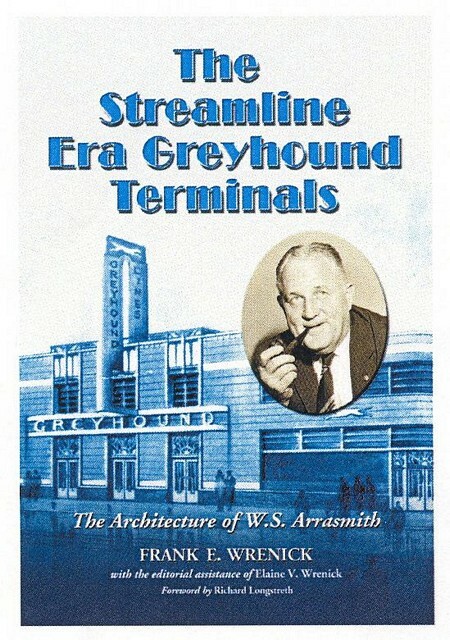 The second part of the book focuses on the streamline era of Greyhound terminals including a short history of the Greyhound company, a general review of the development of bus terminals from street corner to huge terminals, a look at streamline styling from 1937 to 1948, a look at the integration of Greyhound bus and terminal design, the company's post-war transition from streamline to avant garde style, and a description of several Grand Openings of new Greyhound terminals which were always gala affairs. The body of the book will conclude with a picture gallery and rich textual material on 28 significant Arrasmith terminal designs with images of original renderings, and period photographs and drawings. The book also contains magazine ads featuring streamline Greyhound terminals. The footnotes and appendix contain a chronological list of Arrasmith's architectural associations and partnerships, his Greyhound commissions, and an extensive list of his other work. In addition, there is a compilation of source citations by subject matter and a listing of sources for the renderings, images, and photographs contained in the book. The book will also have an index. A Foreword for the book was written by Professor Richard Longstreth of George Washington University. Professor Longstreth well known as a specialist in American Studies who was instrumental in the preservation and adaptive reuse of Arrasmith's Washington D.C. streamline terminal. Q: Did you have to diligently dig for sources, or were many readily accessible? A: It was necessary to dig for everything that is part of what made the project such fun to pursue, and that is part of the reason it took 17 years to finish. Of course one advantage of this was that I turned up more and more as time went by. One thing about writing a book. It is never done. There is always more to find, more to tie together, and more to write about. Q: Tell us how you came to write this book. Was it an interest in W.S. Arrasmith, Greyhound buses, Greyhound terminals, streamline (art moderne) architecture, or some combination? When did a casual interest turn into a book-publishing project, and what drove that to occur? Around 1985 I began searching for streamline architecture where ever I went and accumulated a collection of slides from around the country of all types of streamline architecture from diners to churches (only one). As you probably know, when compared to other architectural styles, streamline styling in architecture is a rarity. Of the examples I found, Greyhound terminals were the most prevalent. Here in Cleveland we have what I consider to be the finest extant example of Streamline Moderne architecture in the form of our 1948 Greyhound bus terminal. I became involved in an effort to preserve the building which in the late-1980s/early-1990s was threatened with possible demolition. After initiating a preservation effort one thing led to another including newspaper and magazine articles, empaneling a forum sponsored by the Cleveland restoration society to discuss and familiarize people with the significance of the building as a part of both the local and national architectural fabric, and just plain drum beating. As part of this preservation effort, I drafted a successful nomination of the Greyhound terminal to the National Register of Historic Places. As it ultimately turned out (ten years later) it was instrumental in Greyhound's decision to retain ownership of the terminal and restore it - which occurred in 2000 - at a cost of over $5 million. As part of the preservation effort I decided to try to locate the building's architect and/or his firm figuring that this was a faint hope indeed considering that the last Arrasmith Streamline Moderne Greyhound terminal I knew about was the one built in 1948 in Cleveland - 40 years previously. I ran an ad in AIA's [American Institute of Architects] national publication in 1988 and was contacted by one of the Arrasmith firm's architects, Milton Cooper. This was pre-internet and I actually didn't know the Arrasmith firm existed. My contact at the firm was a young relative of one of Arrasmith's partners no less! He put me in touch with Arrasmith's wife, Betty, and daughter Anne who both lived in Louisville. They in turn arranged for me to meet not only with them but with Ed Baldwin, Arrasmith's chief engineer, Messer's Judd and Rapp, members of the firm, friend Stratton Hammon, a summer intern who worked for Arrasmith, his secretary, and Mr. Hubbach an associate -- among others. Everyone I met was delightful, and more than happy to share their experiences, recollections, and memories regarding Arrasmith. I made several trips to Louisville to interview everyone. In the process I learned about William Scott who had a large personal collection of material on Kentucky architects, all of which he shared with me unstintingly and which was essential to the development of the Arrasmith story. After visiting Louisville I began receiving hand written pen and ink letters from Ed Baldwin, some written of his own accord and others in response to questions I had sent him. Ed's incredibly sharp mind - he was then about 80 years old - and the detailed recollections of his time with Arrasmith were invaluable. In all he sent me more than eleven letters together with volumes of details concerning the firm, its physical offices, partnerships, business letterheads, blue prints, etc. I think that the moment when a casual interest started to look like a book came when it appeared to me that the Cleveland Greyhound terminal needed a "representative" to speak for it if it was to be preserved. My initial research had been enthusiastic but relatively slow going. My hope to do a book became a firm commitment when my ad in the AIA magazine put me in contact with Arrasmith's family, friends and associates. Q: Have you ever been involved in publishing a book before? A: No, but my wife and I founded two international antique automobile preservation societies and wrote and published the quarterly publications for them for a total of 37 years between the two. My wife was my editorial advisor on the book as well. Q: How many of the existing terminals have you personally visited? A: I haven't counted but not nearly enough. I do have an extensive collection of Greyhound terminal post cards and some Greyhound memorabilia and mounted a display at the restored Cleveland terminal in 2000 when it was rededicated 52 years to the month when it first opened. And, believe it or not, there is a g gauge model railroad copy of the streamline Evansville, Indiana greyhound terminal - the original of which has been preserved. Q: Have you ever had a chance to take a bus trip to or from one of the Arrasmith-designed terminals during your life? Q: How long ago did this project start in earnest? A: I would say 1988. Q: How difficult has it been to get details on Arrasmith's life and work (design plans, accomplishments, collaborators, etc.)? A: There was no published information so fortunately his family, friends and associates were extremely generous with their recollections and materials. The Arrasmith firm lent me original renderings which I took back to Cleveland, and had photographed before returning them. I could not believe my good fortune with their generosity. William Scott opened his archives to me and also lent me whatever I asked for so that I could copy them for my files. It was fun pulling all the pieces together and no small amount of it came into my hands serendipitously - nothing like good old fashioned luck. Q: What was your biggest surprise or exciting moment during this process? A: I guess I would have to say that getting in touch with the people who knew Arra and hearing their stories was the most exciting thing. Every one of them said, "If you didn't know Arra, you really missed something." And, from the recollections I gathered I would have to agree with them. The book contains numerous Arrasmith quips and quotes as a result and I wrote the biographical part of the book from a personal view point. Who he was and the people who knew him made his story infectious. An aspect of his life that is not covered in depth are his WWII experiences. He was very patriotic and maintained a military connection almost all of his life. He wrote a short diary during the invasion of Italy and from that and other sources I drew some very funny stories about his war years which are included in the book. Q: You mention a couple of times, "Arra". Is that the name that friends of his called him? A: Yes, Arra is Arrasmith's nick name which was used by his friends and associates. When I arrived in Louisville the evening before my first meeting with Betty and Anne Arrasmith, I stopped at a Chinese restaurant for dinner. When I opened my fortune cookie at the end of the meal it read "you will meet new friends and talk about many things." Little did that fortune cookie know what it was predicting. I thoroughly enjoyed working on this book and talking with the people who knew Arra personally so, in a way, I wish the book wasn't finished. And, in a way, maybe it isn't. The book has lead me to a series of new finds including a treasure trove of "long lost" and "unknown" Greyhound ads and advertising art work and the son of the artist who created them. I am also working on a book featuring streamline style era architecture of all types. So, as they used to say on your streamline era Silvertone radio, "Stay tuned." If you want to contact Frank directly he can be reached at: fewrenick@yahoo.com and is more than willing to hear from you!